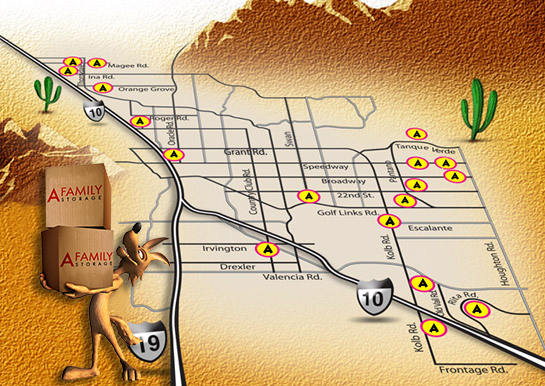 A-Family Discount Storage is the largest locally and privately owned storage company in Tucson. We are here to serve all of your storage needs! At A-Family Discount Storage, we offer air cooled units as well as standard, more traditional storage units. Our sizes range from small, closet sizes (5' x 5'), to large, warehouse sizes (40' x 60'). A-Family can facilitate any of your business, hobby or personal item storage needs. A-Family also offers each customer a free moving truck with a three month rental to help you move in! We work harder to make sure our customers are satisfied. We have no hidden fees, taxes or additional costs. Our prices are our prices. Additionally, our locations will 'meet or beat'* any of our competitors' prices, so you get the best deal at the best storage facility in town. *Some restrictions apply. Please contact one of our locations for more information.